The 44 inch snow blower is new for 2018, with improved performance, reduced set up time and easier operation. It has a premium lift handle and improved ergonomics of the control lever make it easier to use. It has the capacity to handle big snow removal jobs and works well in all snow conditions. This snow blower is ideal for home and estate owners in heavy snow regions. Faster rotor speed increases the maximum throwing distance by 40%, up to 50 ft.
44 inch Snow Blower Attachment for 100 Series Tractors The 44 inch snow blower is new for 2018, with improved performance, reduced set up time and easier operation. It has a premium lift handle and improved ergonomics of the control lever make it easier to use. It has the capacity to handle big snow removal jobs and works well in all snow conditions. This snow blower is ideal for home and estate owners in heavy snow regions. 44 inch Snow Blower Attachment for 100 Series Tractors is rated 3.6 out of 5 by 30. Rated 5 out of 5 by DeerBoy from Quality Just removed this after first winter using this on JD E140. We have 1000' gravel driveway in Vermont. 100" of snow this winter - most fell in the 5-9" range. This snowblower was fairly easy to hook to my tractor (4 solid hours), and disconnected quickly. Broke only one shear pin (comes with a couple extras but ordered more). Used it about 20 times - my advice: buy JD tire chains, 2 JD rear weights and bracket - just make it part of what you budget for. They are a necessity on even a slight grade with the heavy attachment. Also - if you have gravel drive buy the larger aftermarket ski type skids (forgetting brand name) but they sell them at HD - stopped me from throwing too much gravel (if over the winter I threw a wheelbarrow full of gravel that would be a lot). Overall a quality product that paid for itself in the plow bill and driveway restoration post winter. I was pleasantly surprised. It was fun too. Never ever reach your hand in a snowblower even when off and you'll be good, just like a lawnmower. Just a PSA while I'm at it. Would recommend this item and I don't say that about every tool I buy. We did not have those 30" snowfalls at one time this winter and I suspect most this could handle us about 10" at a time, depending on snow type, so you do have to keep up with it. I'm not exaggerating I could do our driveway and parking spaces in 30-40 mins with powdery snow. It's literally how much time it takes to circle the driveway in three passes. It's that easy. Keep some WD40 handy to grease the chute and apply where needed. Wipe off snow before putting it away each time. Really worked great. Rated 2 out of 5 by William from Poor Design.... too heavy an attachment for a 100 Series... Poor Design.... too heavy an attachment for a 100 Series John Deere. Would work best on flat paved surface. Any slopes and the mower has trouble with traction even with chains. Snow blower often digs into the ground or a gets pulled into a snow bank if you are trying to widen a driveway. Difficult to steer. No adjustable control on height while using. Does not function well. Rated 5 out of 5 by Yves Chenevert from Great on hilly road Work very good. Throw snow far. Wet snow or dry snow work well. Only thing on hilly road (10% grade) the tractor spin quite a lot. But snowblower work great! I add the electric lift so it easyer to work with. My driveway is 1 miles long. Rated 2 out of 5 by MontanaGardener from Product was delivered LATE and we had to beg Home Depot to give us updates. Ordering John Deere p... Product was delivered LATE and we had to beg Home Depot to give us updates. Ordering John Deere products via Home Depot was a bad idea. JD sends out parts and in our hands the next day. Also, The snowblower is FLIMSY and needs to be properly engineered. Very frustrating. First time out the pins popped out, the snowblower came unfastened from the tractor AND we were stuck. This was NOT a good experience and this is NOT a well engineered product. Works well on a straight run. Does NOT tolerate sticks/little stones. The pins break and now we are so happy that Home Depot does not stock any shear pins. Also, assembly took two men longer than the specified one hour assembly time. The instructions have very BAD pictures, low resolution, led to lots of confusion. Where is the great JD engineering? AND Home Depot, please learn how to support products sold. Rated 5 out of 5 by Cybersaw from These last few weeks (think polar vortex) in Michigan have... These last few weeks (think polar vortex) in Michigan have been brutal, and we've seen over 3 feet of snow along Lake Michigan. This unit is a beast! I've got it paired up with a D125 tractor (20HP) and it throws the snow a good 40-50 feet! No clogs so far. Installation manual is fair at best. Rated 2 out of 5 by Goat from Blows snow great! Due to poor design the second stage likes to ice up. This toasts the $70 belt q... Blows snow great! Due to poor design the second stage likes to ice up. This toasts the $70 belt quick. Rated 4 out of 5 by Happy owner from Small but mighty - great blower Unit was easy to install although actual pictures of an installation in manual would be really helpful . Took about 1 hour to install excluding removal of mower deck. Works well , well designed but I putting electric lift on unit due to weight in lifting with the supplied lever . Installed on a d130 ( twin) and it really shots the snow regardless of whether it wet snow or not . Would definitely recommend the unit . Have owned many blowers and tractors over the year and this combo out performs my case compact deisal by a mile . Rated 5 out of 5 by Rick D from 44" snowblower on John Deere D125 tractor I am very satisfied with that new 44" snowblower that I've installed on my D125 JD tractor, I can scrape the pavement lot better then with my old equipement. Those weights and chains on wheels are a must on those tractor. I broke a shear bolt on the first use by my fault I got a big rock in it but no other damage to the snowblower, This is my first snowblower on a tractor and I love it, so quick to clean the laneways and so easy on my arms and back not having to fight with a snowblower that wants to go up over ice or packed snow makes my life easier. Only one thing to say wich is not negative but I'd realy like to talk to the ones who can put this equipement together and install it in 2 hours...that's almost what it take to uncrate it , I'm a handyman but not Speedy Gonzalez and it took me more like 5 to 6 hours all together but I'm happy it makes the job so much easier. I live in Quebec so normaly we have the reputation of having lot of snow but since I got it in late november we didn't got much so I'm waiting for the big one still. Will this blower work with a L130 lawn tractor? I know it works on &quot;D&quot; and &quot;E&quot; series 100 from 110 to 180 but I'm not sure about &quot;L&quot; serie, I have it on a D125 and it's the best investement I did in years, only thing is shear bolts are rather sensitive, I went through abut 5 shear bolts in 1 winter, and that model comes with that long arm to lift the snowblower wich is a little heavy mainly if you have a bad shoulder. I have a JD E170. Is it compatible? Thank you for visiting The Home Depot website. Yes, this Snow Blower Attachment is compatible with the E170 Lawn Tractor. Will this work on E150 ? Thank you for visiting The Home Depot website. Yes, this Snow Blower Attachment is compatible with the E150 Lawn Tractor. Will this work on a E100 tractor? I did installed this snowblower attachment on my E180 no problem. I believe this is made for all new E100's series. Hope this help. Is this snow blower compatible with the John Deere X320 lawn tractor? Thank you for visiting The Home Depot website. No, this Snowblower attachment is not compatible with the X320. Will this fit the E120? Dear Valued Home Depot Customer, To better answer your question, please contact our HD.com. customer service department at 800-430-3376. Call any day between 6 a.m. and 2 a.m. EST, or call your local store. They can either answer your question or transfer you to your local store to answer your specific question. Does this include the tractor or is it just the attachment? Thank you for visiting The Home Depot website. 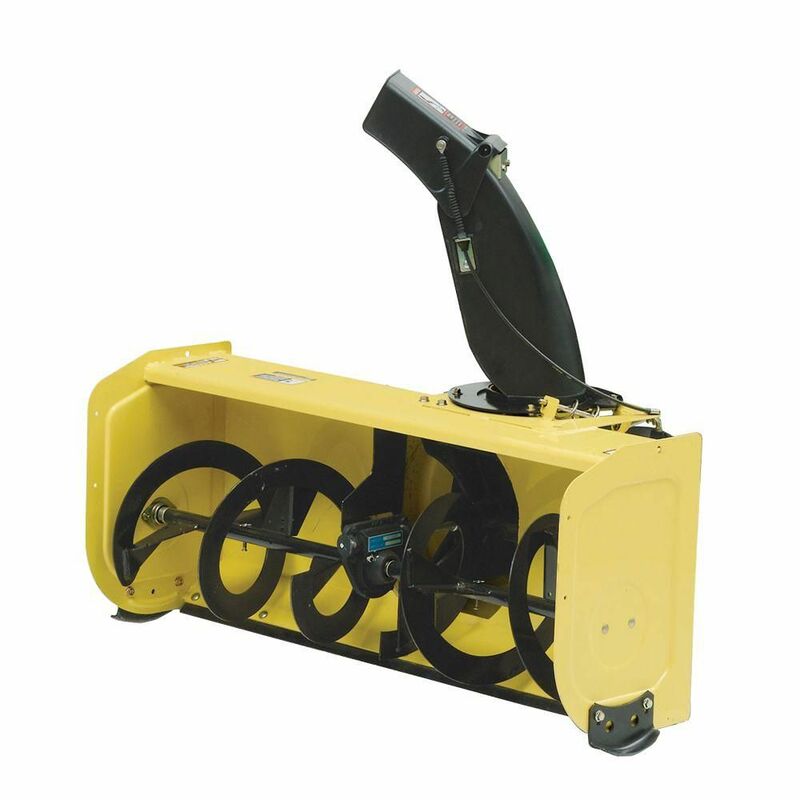 This product page is just for the 44 inch 2-stage Snowblower attachment. I use this on my D105. Works great! It will work fine on your E110.